Our new exhibit is open! Preserving a Heritage, Building a Community: Carpatho-Rusyns in the Slate Valley tells the story of immigrants from Slovakia and Southern Poland who made the journey to the Slate Valley of New York and Vermont in the late 1800s and early 1900s. 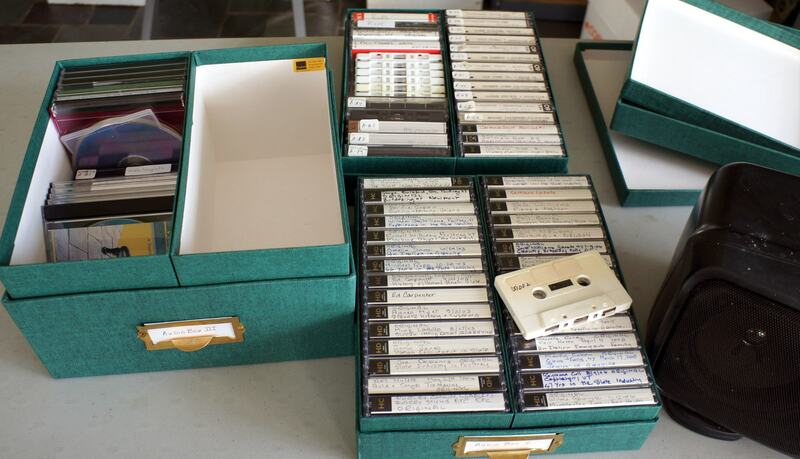 All of these oral histories were digitized!! Some are available now on our website, but in a few months, they will ALL be available on our new website. We will keep you updated! Creating the exhibit was a great adventure. We had very little information to go on as there is not much of a written record. We found some threads of information in Gwilym Robert’s book New Lives in the Valley, one of our favorite sources here at the Slate Valley Museum. Newspaper reports from the time documented the “Hungarian” immigrants getting into bar fights and inciting riots—but there was little other information. Luckily, when we started to research, we were in the process of digitizing our oral histories. As we listened to the newly digitized versions, we learned great information about the lives of Carpatho-Rusyn immigrants. Mike “Pinkie” Labas told the story of growing up in Granville’s Alley in the longhouses, low-income housing more commonly called tenements. Labas talked about all the ways that he and the other children helped their parents bring in extra income. For example, the children spent their summers picking berries in nearby woods and fields as well as snaring fish in the Mettowee River to sell to their more well-off neighbors. Carpatho-Rusyn workers often had to do the most dangerous of quarry jobs–working deep in the pits, setting off explosives and shoveling up the slag. 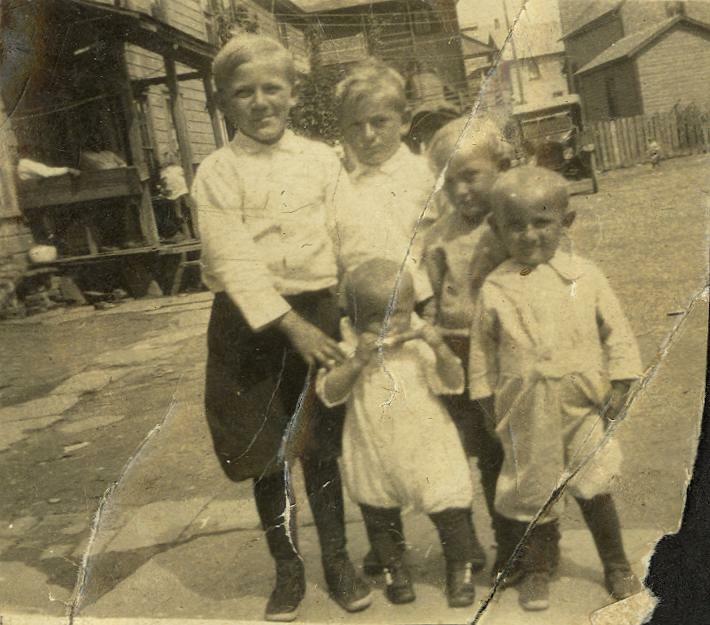 The children of John and Anna Labas standing in the center of the Alley, where the Slate Valley Museum is located today. We also found videos featuring Mike “Pinkie” Labas, church activities at Saints Peter and Paul Byzantine Catholic Church, as well as several members of the Prehoda Family. We QUICKLY had the videos digitized and were able to incorporate them into the exhibit. Look for a few snippets from these on YouTube soon. Or . . . you could come to the Slate Valley Museum to listen to them in person. The exhibit will be on display through December 2013. This entry was posted in Uncategorized and tagged exhibits, Granville, history, immigration, Polish, slate, Slate Valley Museum, Slovakians, South Poultney, West Pawlet. Bookmark the permalink. SVM’s First Quarry Tour in Four Years!!! slatevalleymuseum on Calan, Calon and Cariad! Edie on Calan, Calon and Cariad! Timothy M Noble on All through the night! catrinw on All through the night!